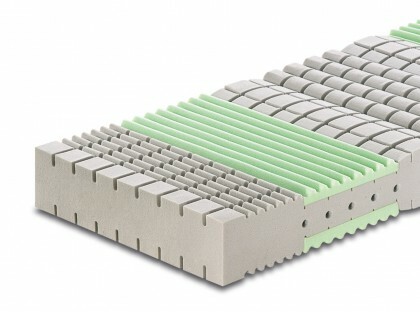 The hypoallergenic Kuschelmed® De Luxe mattress with removable lining has a special three-dimensional shaping that improves the quality of rest by reducing compressions in the points of contact and favors position variations during sleep. The channellings on the surface make it a cool and always aired product. 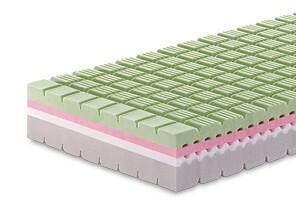 This mattress is one of the most appreciated within our range and is classified as a 1st class medical device. 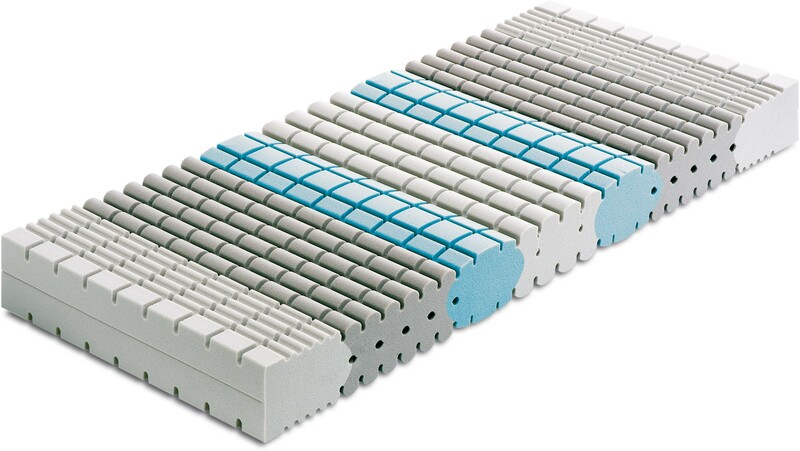 This mattress is ideal for the prevention and alleviation of postural problems and decubitus pathologies. Different and specific comfort zones. Wear-resistant Interlock fabric core cover which enhances the ergonomic features of the core thanks to its strong elasticity. 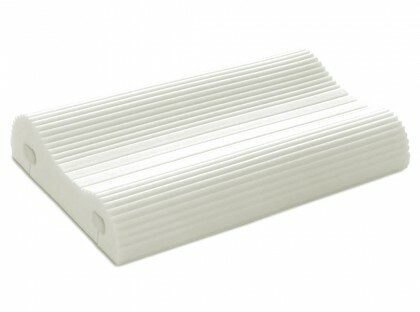 18 cm high ergonomic core in Aquatech® (density 65). A choice of 4 different solutions for the external cover: Bielastic and Medicott®, Space Fabric, 4 seasons, Memory and Poly Lyocell®. We grant a 5 year warranty for all Manifattura Falomo purchased products. It shall enter into force from the date of delivery and refers to material or manufacturing defects. We reserve the right to replace a faulty product. The mattresses and slat bed bases are designed as bed systems, therefore made strictly for one another. If a Manifattura Falomo mattress is combined with a bed base that is not suitable, we can not accept requests for warranty services. For the first 2 years from the date of purchase, we offer a full warranty on all Manifattura Falomo’s products. Within this period we remedy all damages related to material or manufacturing defects through free replacement, if the product can not be repaired. From the third year from the date of purchase a progressive warranty enters into force, related to the selling price according to the following chart: 1st year 100%, 2nd year 100%, 3rd year 80%, 4th year 60%, 5th year 40%. The recognized amount is deducted from the purchase price of the new mattress. The purchaser is charged with transportation costs for the return of the item to the headquarters. Following our service under warranty, the current warranty period is not interrupted and a new one is not started. The following items are covered by a 2 year warranty: electric motors and electronic parts (excluding parts that are subject to wear, such as batteries, etc.). 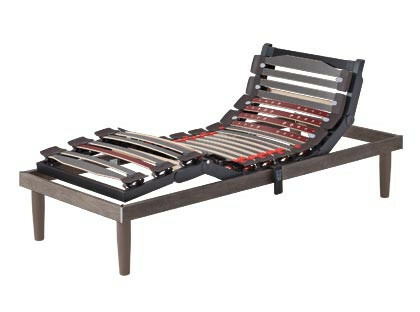 Slat holders on bed bases. Pillows and cushions. Bed base covers and mattress covers. The following are excluded from warranty conditions: defects due to inappropriate treatment or use (use of force, overload, changes made by the purchaser, inadequate bearing plan). Defects caused by natural wear. Mattress covers and handles and other upholstery made of fabric. Traces of dirt, e.g. mold stains and/or organic liquids. Indirect damages. Warranty rights can be requested at the official Manifattura Falomo store where the purchase was made or at Manifattura Falomo’s headquarters in the case of an online purchase made through the website www.manifatturafalomo.com. The right is certified through the warranty booklet, the receipt or invoice confirming the purchase. For more detailed information please download the warranty PDF from this link: DOWNLOAD WARRANTY. For deliveries in Europe, the cost will depend on the destination of the goods and will be viewable in the cart during order confirmation. It is possible to deliver also to upper floors with an additional cost of € 25. Shipping costs in Italy are always free if delivery is on ground floors. How will your product be shipped? The product will be shipped within 10 working days from the receipt of the order. Shipments will be carried out on all European territories. All products are provided with a strong packing in cardboard box and mattresses are provided with a double nylon for a better protection of the product. For more detailed information please visit the Shipments page. Assistance & Customer support: always at your disposal to improve your sleep. 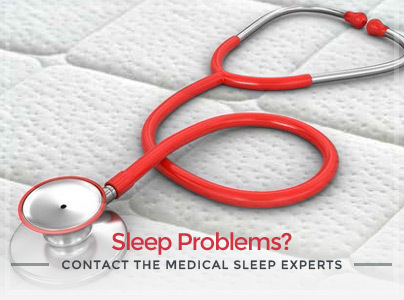 Contact the medical sleep experts and get a free personalised advice on your situation! 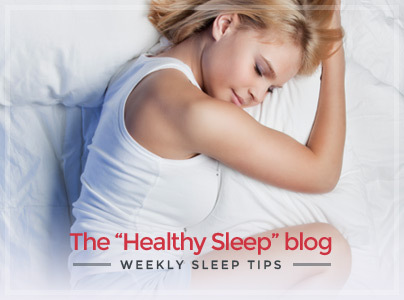 Check out all the content of our blog dedicated to “Healthy Sleep”, which will guide you through a more aware choice of your product. Email us by filling out the required fields on this page. We will reply in less than 24 hours! Discover in this section of the web site the answers to our customers’ most frequently asked questions. Contact us for further information regarding our products, their use or purchase. We will reply within 24 hours!